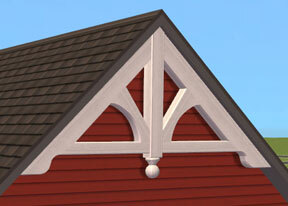 To use the gable decoration you must use the "moveobjects on" cheat. I’ve made this ornament in 7 sizes. They can be used on roof gables of 2, 3, 4, 5, 6, 7 and 8 tiles width. It includes 7 extra textures matching the brackets colors. Mesh and textures are packed separately. Your blog is really nice, you should keep going with it.